The night before travel can be hectic. We’ve all done it at least once: stayed up till 2–3 am, crashed for a few hours, and headed to the airport with a dizzy head hoping to fall asleep on the plane only to find out that it was impossible. Seizing every minute of your life is nice. However, with the mix of unpleasant plane rides and the so-far-unavoidable jet lag, the night before your flight may be the only chance for a good night sleep during this whole trip. Why don’t you take advantage of it, wake up with beautiful skin and get on your journey with full energy? Going to Bali this winter? Woot! Let’s put on that short floral skirt now! Well, if you are not from the Winterfell and still want to sleep well on the plane, perhaps consider bringing something warm. The temperature on airplanes is usually kept around 72–75F, but sometimes it can get to as low as 64F especially for long-distance flights, which is cold if you only have the thin blanket from the airplane. Some road warriors may have told you their secret sauce of traveling without jet lag, one of which may be staying up during the flight. Sounds simple, right? The downside is, staying awake for a 12-hour flight plus the commute to and from the airport and the time difference can easily get you sleep deprived for more than 24 hours. Trust me, the sleep debt from 24 hours of no sleep cannot be quickly paid off. Want to know what makes it worse? You would still have jet lag after the pain of staying awake for more than 24 hours. Jet lag is caused by the gap between your circadian rhythm (body clock) and the local time zone, so staying awake throughout the plane does not help you close the gap faster. Exhaust yourself during flight may help you fall asleep on the first night, but the jet lag will almost always kick back on the second night to keep you awake. That’s why the best way to recharge yourself is to get as much sleep as you would like on the plane. You may say, I know it’s important to sleep on the plane, but my sleep is never good during flights. You are not alone. Airplane seats are not exactly as comfy as home, let alone all the lights and noises and people walking by. The good news is, there are some things we can do to make our journey more comfortable. 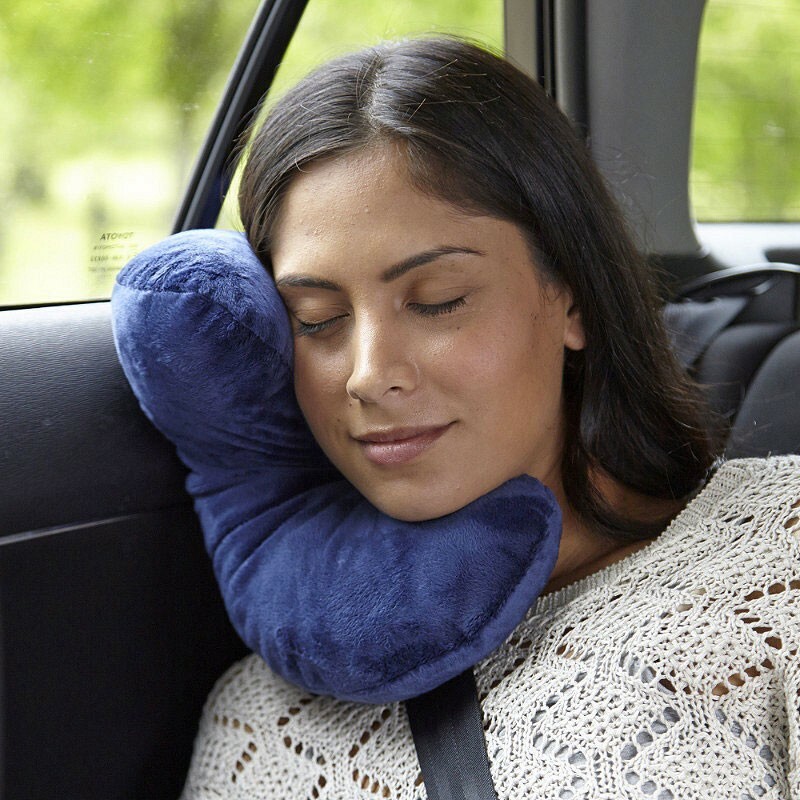 For example, a soft neck pillow that unfolds three-ways to best support your neck with various sleeping positions on the plane, a simple sleep mask to shield the light from the TV next to you (don’t worry, you will be able to replace this one with the jet lag-eliminating mask soon), a pair of comfortable socks. Some prefer compression socks to reduce swelling. Most importantly, don’t forget to put a pillow underneath your lower back to keep your spine nicely supported. Keeping blood flows to reduce swelling is more critical for the long-distance flights than the short ones. You may have experienced swollen knees and ankles after sitting for a few hours. Make sure that you get up, walk around, and stretch every a few hours. The small effort will pay off! The humidity of a typical cabin is less than 20%, while that in the Sahara desert is about 25%. How surprising! One reason for such low humidity is to slow down the corrosion of the planes. What can we do to cope with the desert in the air? Make sure that you drink enough water on the airplane, which will not only keep your body hydrated but also prompt you walk to the bathroom often. Also, bring travel-size moisturizers with you. If you clean up with warm water and reapply the cream every a few hours, you will look nice and refreshed walking off the plane. If you keep a close eye on the scientific news, you may have heard that 2017 Nobel Prize is granted for research on circadian rhythm. In fact, numerous scientific studies have shown that having a regular schedule helps to keep your circadian rhythm in check, which promotes healthy digestion and sound sleep. We have not invented a tool to allow you to fast forward or slow down your biological clock yet-we are working hard on it! So before that’s available, a best practice would be to keep a regular sleep schedule and meal time during vacation. It’s so easy to indulge ourselves on the delicious steak or seafood during vacation, but don’t forget to have a balanced meal with fruits and vegetables. Some fruits and vegetables are very delicious and unique to where you go. Other than the usual medications that you need, bring a small first-aid kit and some painkillers. Oh, don’t forget to pack some diarrhea medicine if you are into street gourmet hunting like I do. I once stared at the ceiling in Bali for three days from food poisoning. You don’t want that to happen to you. Here are all the travel tips that I’ve collected in the past years, each has one painful story behind. If you have your travel tip collection, please reply and share. Hope the tips make your holiday travel healthier and more pleasant! I just started using Medium and will write more. If you find this article helpful, follow me to see more!